 Log In needed $74 · Haul soil, gravel, even a wet dog in the back of your SUV or minivan! The Kerry-All Pouch cargo liner is designed to fit in the rear of an SUV or minivan, but it can also be used in ¼ ton or full size pickup trucks. Use the liner to keep the back of your vehicle clean when hauling compost, plants, mulch, potting soil, anything that could make a mess of the carpet back there. It?s even a great spot for that wet dog. All Kerry-All Pouches are made from 14 x 14 weave woven polyethylene with an ultraviolet coating on both sides, for a total thickness of 16 mil; much heavier than those cheap tarps people struggle with and replace every few months. The cargo liner will last for years. The cargo liner has webbing loops along the top edges to secure it in the back of the vehicle, using bungee cords or rope. Attach the front to the headrest posts and the sides to anywhere you can find a place for a hook. Included with the liner are suction cup hooks to attach to the side windows fort more attaching points. 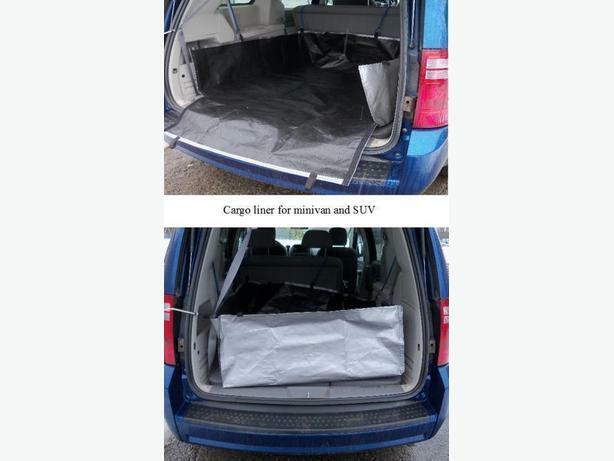 The rear side folds down to cover the edge of the van when loading or unloading and has full-length Velcro to secure the cargo liner as a solid container. The dimensions of the standard unit are approximately 56" long x 42" wide x 14" high. This size is designed to fit a van with three rows of seats, with only the rear seat needing to be folded down. When not using it, the liner folds up for easy storage under a seat. $73.95, HST & Shipping not included.